You see a large number of small ant-like bugs with wings. But are they ants or termites? Both ants and termites swarm, and often times, these winged creatures are confused with one another. 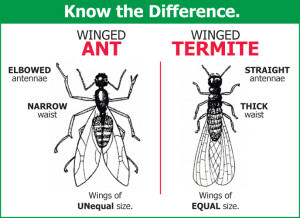 So, here’s a quick reference guide to know the difference between ants and termites. It is important to know which pest you have because prevention and treatment of each one is different. Ants have a narrow, constricted waist while termites have rectangular shaped bodies with no constrictions. Ants have bent antennae while termites have straight, beaded antennae. Winged ants will have a shorter hind wing and longer front wing while termites have wings of equal length. Ants are usually dark in color while termites are generally light in color. Ants will eat just about anything while termites only eat wood, including paper products. If you think you may have a termite problem at your home contact us, and we will set up a free Termite Inspection for you.